Thoughts of new wading boots are dancing in my head as I pick up the pace, and make my way to the lake. It has been easy for me to persist, and remain faithful to my powerwalking routine. I’ve become addicted to its healthy effects on my body, but even more so, to the quiet of the early morning. Walking is easy and natural, so getting into a rhythm is almost effortless. I soon break into an easy sweat and then kick-it-up a notch. Time gets lost, and before my thoughts have traveled very far, I see the lake in the distance. I can’t wait to get a fisherman’s opinion on my wading boots. I’ve been thinking about getting new boots for a while now and I want to make an informed decision. As I reach the lake I can see Ben casting his new ultra-light, … but no sign of Mel. Mel hasn’t shown up yet. Ben says that he’s on his way. He’s bringing his float-tube this morning and he’s gonna be a bit late. He wants to fish the deepest part of the lake and beat us on today’s fish-count. Kind of sneaky, for a fishing buddy, but we laugh it off, and in our hearts, we wish him well. I’m the newest member of this fishing club, so I have to tread carefully until my “number of catches” elevate my status and position on the team. Ben gives me a nod, as I throw my line into the lake. “Good cast”, he says, as I drop my tackle at the edge of where we believe the lake to be dropping off. I crank a few turns on my reel to take the slack out of my line and drop my fishing pole into its rod holder. All that’s left now is for that fish to come and try out this new bait I’m using. As I gaze across the lake, I realize how fortunate I am to be here, surrounded by all this beauty and quiet. The birds are welcoming the day and the eagle is perched on a tree branch less than 20 meters away. This lake is home to lots of small feisty rainbows and for us, it’s mostly a catch-and-release fishing exercise. Once in a while, a fish will swallow the hook too deeply, or some other mishap will occur, and it’s impossible to save the fish. That’s where our friendly eagle comes in. He’s not big on catch-and-release. He has 2 eaglets in the nest across the lake, and these non-survivors are just the ticket for them. 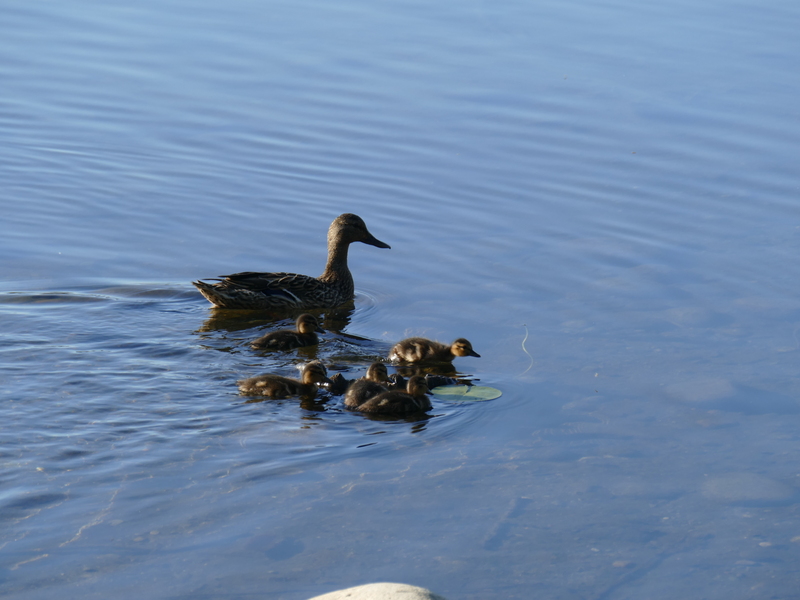 A young family of Mallard Ducks swims casually by, in front of me. Part of the early morning scenery, here at the lake. The fishing is a bit slow and this is prime time for developing our latest fishing theories. Mel is the senior member of our fishing team, so this gives him more status. He says that the fish are schooling and swimming around the lake. On some mornings, he’s seen them rising on the other side of the lake. Experience and respect have taught me that there’s a right time to ask a question or seek an opinion, and it’s not now, cause Mel has just shown up with his float-tube. Suddenly we shift our focus from the lake to Mel. Mel is 76 years old and everyone knows him … and he knows everyone. What an inspiration to the younger set, like us. (a cough). A lifetime of stories and adventures that we freely take advantage of, to embellish our own fishing stories. Mel, we say in almost unison, “that’s not fair, you’re leaving us on shore, and fishing the deep water where all the big fish live. His quick retort to that is, “all’s fair in love and war” … but Mel, we are your friends! … and we don’t want you to fish alone. What if you hook the big one and we’re not around to help. “Good Luck with that story”, he chuckles, as he leaves the shoreline for the open lake water. 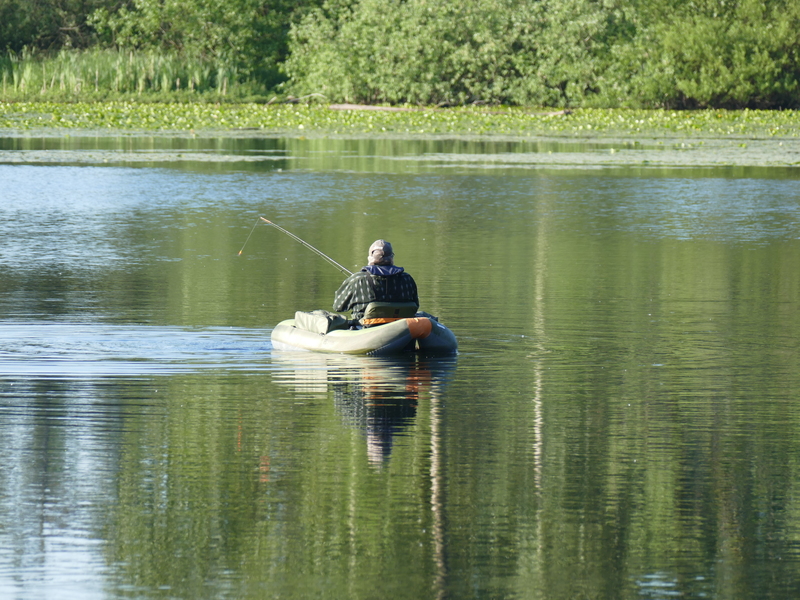 As we watch Mel propel his way across the lake, the fishing picks up. Ben and I catch a few fish each and we see Mel reel-in the odd fish as well. The Mallard family paddle their way by us once more and an Osprey makes a quick fly-by over the lake. 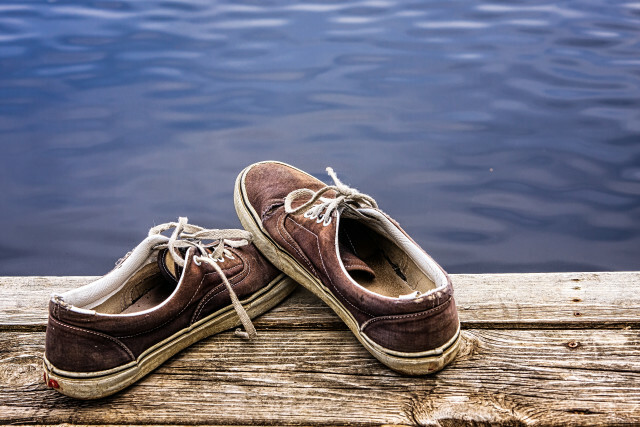 Baby Ducks, Float-tubes, and Fishing Stories have made me forget all about my Wading Boots. Oh well, there’s always the next fishing trip. I welcome your comments, questions, and suggestions. All fishing problems have a solution and can often be solved by the simple purchase of a special lure, croc, or spoon. A visit to the local fishing tackle shop has been known to produce positive results as well. When all seems to be lost, a cold beverage, in the late evening may bring the desired result. Contact Me, if you need someone to clarify some fishing story or a puzzling theory that only a fellow fisherman could understand.